10th June, Hong Kong: ABF Tour 2012 Thailand leg second runner-up, Kang Bo Long of Malaysia and ex-national youth, Gloria Yung of Hong Kong claimed their first Men's and Women's tour title of the ABF Tour Hong Kong leg at HK Bowling City on Sunday. Fahad Al-Emadi started off the match with a strike and a spare in the second frame as Kang Bo Long managed two spares. But the ex-Malaysian national bowler went on a strikefest reeling in nine consecutive strikes leaving the Qatari trailing the game by a hugh margin. Kang, who also registered the highest game of the championship, was in superb form ending the match 278-195 to capture his first-ever tour title while Fahad conceded defeat. "I didn't want to rush and took time to clam myself and focus on each shot," said the 26-year-old proshop supervisor, Kang Bo Long. "I'm actually speechless and excited to have won this title." "I'm now looking forward to the Tournament of Champions now that I've enough points with a third-place finish in the Thailand leg and a win here," added Kang, who ended Hong Kong's hope of the men's title when he breezed through the semi-final with a victory over Wu Siu Hong, 265-193. The champion struggled in the earlier two rounds having edged India's Dhruv Sarda, 187-155 in Round 1 and Hong Kong's Eric Tseng, 182-152 in the second round to reach the semi. Fahad sailed past 2010 ABF Tour TOC winner, Ryan Lalisang of Indonesia, 200-168 in the other semi and 2010 ABF Tour Macau champion, Joshua Chow of Hong Kong 212-203 in Round 2. He also edged team-mate, Khalid Al-Doseri, 205-192 in the opening round. Meanwhile ex-national youth, Gloria Yung of Hong Kong clinched the women's crown in a closely-fought all-Hong Kong final match against ex-national, Cookie Lee. Lee took a 20 pin lead early in the match after reeling in four consecutive strikes but had an opened frame in the seventh as Yung managed a double strike in the fourth and fifth frames to level things up by the seventh frame. Yung went ahead of Lee by 3 pins after knocking down another double strike in the eighth and ninth frames but Lee also doubled up in the ninth and tenth frames. Lee needed another strike to stand a chance of snatching the match but downed only 9 pins. Yung spared her last frame and an eight pin count in her bonus frame was good enough to clinch the crown by just a single pin, 212-211. "I had barely made the tour in 16th position and I was expecting to be knocked out in the first round when I was matched up against a former tour winner," said the 29-year-old former Hong Kong national youth member. "I'm simply overjoyed to have come away with this victory. I'm now hoping that I can qualify for the grand finals." Yung dashed Hong Kong national team's hope of winning the women's title when she defeated Chan Shuk Han, 188-168 in the semi-final. 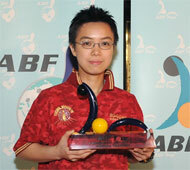 Lee sailed past 2011 ABF Tour Macau leg champion, Julia Lam of Macau, 190-144 in the other semi. Dr Danny Santos, Asian Bowling Federation Vice President and tournament director gave away the prizes to the champions. The next stop will be in Macau, China on June 17 after the Macau China International Open 2012. For further information and details, please contact ABF Tour Committee at Tel: +852 2893 6039, Fax: +852 2893 6290; Email: hktbc@netvigator.com.